Call me biased, but I have yet to come across a William Parker recording I didn't like. The bassist has a unique talent, among players in the free jazz scene, of being able to bring together musicians from varying backgrounds and create a coherent sense of unity. Painter's Spring presents no exceptions to the "Parker Rule." The pared-down instrumentation on this record catches Chicago drummer Hamid Drake, a monster powerhouse with amazing breadth, along with New York saxophonist Daniel Carter, a quirky and capable player in his own right. 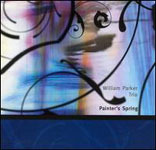 While Parker records often tend toward fiery self-expression, Painter's Spring makes frequent and ironic use of the walking bass line, swinging drum accompaniment, and linear melodicism. The striking feature of this record is that the musicians display more obvious "organization" than might be found on their other records (witness Parker's first solo record, 1995's Testimony, for a beautiful example of the latter). It's as if the trio is often holding back on the intensity it brings to the arena, though occasionally the fire burns free (eg. track four, "Flash"). As a result, Painter's Spring reflects superficially reserved emotional expressionbut to the astute listener, that's just another mode for the communication of artistic freedom. Reserved intensity can be just as potent as the fully unleashed sort. The beauty of this record is that it bears obvious appeal to free jazz newbies, or listeners coming from more traditional contexts. Hopefully this vehicle will transport many listeners into the depth of musical expression that is William Parker. It's certainly among the greatest pieces of work he's put out. Track Listing: Foundation #1, Come Sunday, Blues for Percy, Flash, There is a Balm in Gilead, Foundation #4, Foundation #2, Trilog. Personnel: William Parker: bass; Daniel Carter: alto and tenor saxophone: Hamid Drake, drums.